Early Words Together at Two is an adaptation of Early Words Together, designed specifically for families of two-year-olds. The vocabulary of children from low income families can lag behind their high income counterparts by up to 17 months at the age of three (Gascoigne & Gross, 2017). However, the home learning environment can have a positive impact on a child’s communication and language development, and has been shown to have a greater impact on a child's intellectual, social and emotional development than the parent's education, occupation or wealth (Sylva et al, 2004). Early Words Together at Two helps to improve the home learning environments of families of two-year-olds. It is a practitioner-led programme designed for private and school nurseries and children's centres, who serve low-income families, or any family who may be looking for ways to support their child's language development. Between January 2017 and March 2018, the programme was supported by a grant from the Department for Education. Twenty settings in Leicester and Bradford took part and the programme served approximately 130 families. Overall, Early Words Together at Two was proven to have a statistically significant positive impact on children, parents and practitioners. 84% of parents said they now better understand how important it is for them to talk with their child, and 77.3% of parents said they are more confident than before in sharing books and stories with their child. The programme was proven to make a statistically significant difference to practitioners' confidence in supporting parents to enhance their child’s early home learning environment. There was also a statistically significant difference to children’s interest in books (62.7% increase) and ability to say or sing rhymes and songs (63.8% increase). 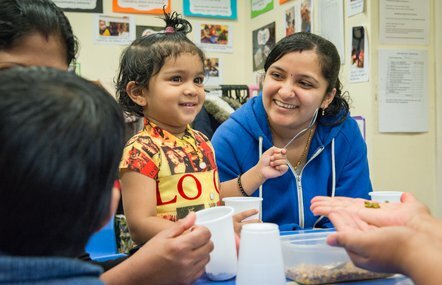 "Early Words Together at Two makes for better practitioners"
"My daughter is singing a lot more, enjoying sharing books more and [her] confidence has grown." We have many resources for practitioners delivering Early Words Together at Two. Read these three case studies written by nurseries and settings who have previously ran Early Words Together at Two. "The toolkit given to us by the National Literacy Trust was brilliant." These three videos show families singing, reading and talking in their home language with their child.